A study has gauged that 80 percent of the total untimely deaths in India due to outdoor air pollution is caused by emissions within the country itself while pollutants transported from outside the country contributed to 16 percent of the mortalities. Within India, home to 14 of the world’s most polluted cities, emissions in the densely populated Indo Gangetic Plain (IGP) are responsible for nearly half (46 percent) of the premature deaths in the country linked to PM2.5. Every region in India, in particular, eastern India, is impacted by the transport of pollutants from other regions within India. Local pollution control alone will not be sufficient to reduce premature mortality in most regions in India, the researchers said. “And the anthropogenic emission in IGP not only hits the population in IGP, that extends from the foothills of Himalayas to the eastern plateau, but close to 20 percent of the impact of IGP emissions is outside of this region,” said study author Liji M. David. David and colleagues wanted to know how emissions from across India (northern India, Indo-Gangetic Plains, eastern India, western India, central India, and southern India) were influencing premature mortality within those regions as well as outside. The study spotlighted the magnitude of the spread of toxic air in east India which is hit the hardest by movement of pollutants from other regions within India as well as from outside the country. This is clear from the results that reveal 39 percent of early deaths in eastern India is because of pollutant transported to east India from different regions (other than eastern India) within India. “The biggest impact (31 percent) is from the emissions originating from the Indo Gangetic Plain,” David said. This impact is matched by the contribution of pollutants (31 percent) transported from outside India. “These effects are shaped by the meteorology, specifically wind flow pattern that transport aerosols and aerosol precursors. We can say that more than 70 percent of premature mortality due to PM2.5 in eastern India is caused by pollutant transported from outside of this region,” said David. Total annual premature deaths attributed to PM2.5 (a) by cause of death and (b) per million people over the six regions in India. CeVD = cerebrovascular disease; CI = Central India; COPD = chronic obstructive pulmonary disease; EI = Eastern India; IGP = Indo Gangetic Plain; IHD = ischemic heart disease; LC = lung cancer; NI = Northern India; PM = particulate matter; SI = Southern India; WI = Western India. Graph by David et al. As per the World Health Organisation the risk of stroke, heart disease, lung cancer, and chronic and acute respiratory diseases, including asthma, increases for the people who live in cities and settlements with declining air quality. “We estimated the total premature mortality due to PM2.5 as 1.1 million,” said David, adding that the contribution of PM2.5 and premature mortality in 2012 from six regions of India was mapped using the global chemical‐transport model. PM2.5(particulate matter) are fine inhalable particles, with diameters that are generally 2.5 micrometres and smaller. This means the average human hair is 30 times larger than the largest fine particle. Sources of PM2.5 pollutants include human activity-derived particles (such as black carbon, organic carbon, sulfates, nitrates, and ammonia) and fine dust. The researchers crunched emission estimates from the SMOG (Speciated Multipollutant Generator) inventory developed by IIT Bombay that takes into account the emissions from major sectors such as transportation, residential, industrial, power, and agricultural. They tapped into mortality data from Global Burden of Disease research 2012 and 2015 for ischaemic heart disease, cerebrovascular disease, chronic obstructive pulmonary disease, and lung cancer in India for all ages. The study determined that of the estimated 1.1 million annual premature deaths from PM2.5 in India, about 60 percent of the deaths were from human activity-generated pollutants spewing out within the region which witnessed early deaths and 19 percent was from the transport of pollutants between different regions within India. As much as 16 percent of the estimated 1.1 million annual premature deaths from PM2.5 in India was due to anthropogenic pollutants emitted outside of India. The numbers essentially point out that local pollution control alone will not be sufficient to reduce premature mortality in most regions in India. “Our study highlights the need for a unified policy to control air pollution and its consequences,” said David. Underscoring the contribution (16 percent) of air pollutants seeping into India from outside the country to premature deaths (attributable to PM2.5), David and colleagues also stressed on the need of collaboration with India’s neighbours to curb pollution. For instance, crop burning in India’s northern states such as Punjab and Haryana, has been blamed for soaring air pollution not only in neighbouring Delhi, India’s national capital but also in the eastern Indo-Gangetic Plains, central states and even southern parts of India, thanks to the prevailing wind patterns during that time. Fire rages in a field, covering the sky with a thick blanket of smoke, Haryana, India. 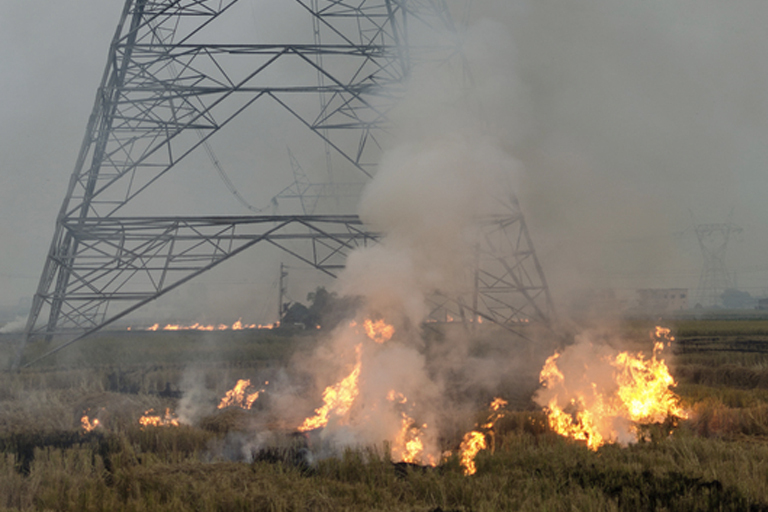 Stubble burning in Punjab and Haryana is a major cause of air pollution in North India. Photo by Saagnik Paul/Greenpeace. Anant Sudarshan, South Asia Director for the Energy Policy Institute at the University of Chicago, who was not associated with the study, hopes the recently-launched National Clean Air Programme (NCAP) will provide another coordinating mechanism to address the problem of cross-border pollution. “Cross-border issues are crucial, especially in north India but these are challenges that are not easy to solve. The prime minister (Narendra Modi), for example, has worked with the chief ministers of Punjab, Haryana and tried to encourage practices that stop crop burning because of its effect in Delhi. But in general, the incentives of upstream and downstream states are not the same,” Sudarshan told Mongabay-India. NCAP aims at 20-30 percent reduction of particulate matter (PM) concentration over the next five years, with an overall goal of mitigating air pollution and improving air quality in the country. The programme, which is not legally binding, also touches on formulating a comprehensive transboundary plan to tackle air pollution, specifically mentioning integration of the initiatives under the United Nations Convention to Combat Desertification (UNCCD) for addressing the issue of transboundary dust. It also lists exploring air quality management at the south Asia (regional) level by activating the initiatives under ‘Male Declaration on Control and Prevention of Air Pollution and its Likely Transboundary Effects for South Asia’ and South Asia Cooperative Environment Programme (SACEP). Occupational and environmental health researcher Michael Brauer of the University of British Columbia pointed to the need for both regional and national management of air pollution in India, with particular emphasis on the Indo-Gangetic plain. “Weather patterns in this region also tend to trap pollution during winter when levels are highest. Emissions from this region that were transported to other regions of India were responsible for eight percent of the deaths,” Brauer told Mongabay-India referring to Liji M. David’s study. Though overall the impact of pollution originating outside of India on deaths was low compared to sources within India, however emissions from outside of India did make substantial contributions in some regions, as much as 30 percent in the western India region, said Brauer who was not associated with David’s study. “While addressing this transboundary pollution will be necessary for India to improve air pollution and reduce the health impacts, priority needs to be placed on reducing emissions within India, especially those in and near to areas of high population density,” Brauer noted. While the study was straightforward and relatively well done, it used only national estimates of health and did not differentiate by states which is a limitation given that we know there are big differences in overall health between states, added Brauer. David, L. M., Ravishankara, A. R., Kodros, J. K., Pierce, J. R., Venkataraman, C., & Sadavarte, P. (2019). Premature mortality due to PM2. 5 over India: Effect of atmospheric transport and anthropogenic emissions. GeoHealth. Banner image: A view of the Taj Mahal in severe air pollution haze. Photo by Vinit Gupta/Greenpeace.